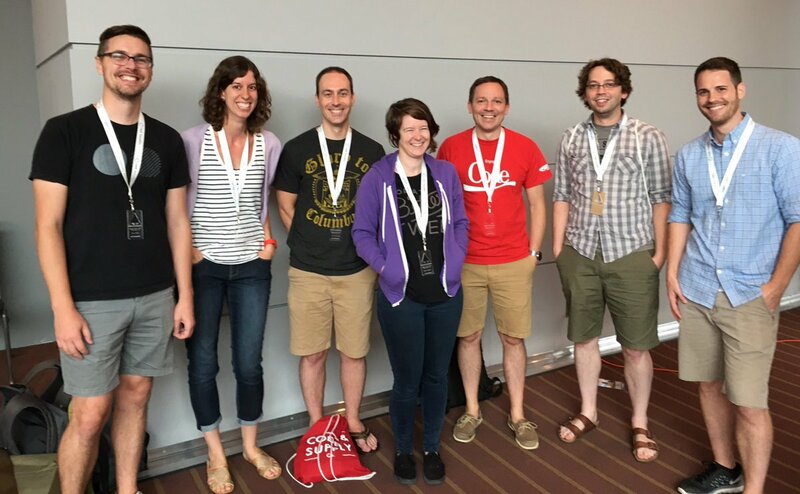 Back in August the entire Base Two team attended the Abstractions conference in Pittsburgh. Between the seven of us, we attended a ton of different sessions. One particular standout was Rachel Krantz’s presentation on apprenticeships. We had discussed starting an apprenticeship program at Base Two in the past, and Rachel’s talk finally got the ball rolling. Base Two, excited to be at the Abstractions conference back in August 2016. A note on compensation: We came up with this number by identifying a current competitive “junior developer” salary ($40,000) in Columbus, Ohio. We calculated three-month’s worth of that, and arrived at $10,000. Our first apprentice was based in Pittsburgh, which has very similar cost-of-living numbers to Columbus. We plan to adjust the initial salary number based on the current local cost-of-living for future apprentices. We are very excited to have finally started and are now halfway into our very first apprenticeship with Reed Dunkle. He has been an excellent guinea pig and has already given us great insight and feedback into how we can improve the program for future apprentices. As with all of our projects, we’ll be iterating and improving this process as we go. Over the next few weeks Reed will be publishing his own blog posts about his experience so far. Stay tuned!